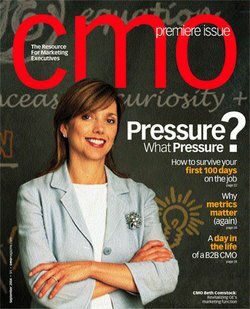 How Long Does a CMO Live? The Book, What Sticks, Why most of the Advertising Fails and How to Guarantee Yours succeeds by Rex Briggs and Greg Stuart, says that a CMO tenure is getting shorter every year. His career, not due to stress from business, as a Chief Marketing Officer, is an average of 2 years. Not a good thought for aspiring marketing professionals. Increasingly, CFO and CEO are professionals with Finance background, and therefore the approach towards marketing has changed. Marketing needs to be more accountable (read predictable) and linked to balance sheet to forecast figures to the shareholders. Marketing effectiveness or Marketing ROI is the buzzword, each dollar spends needs to be accountable and marketing more scientific and metrics driven. Hmm so there is an important question does a good Marketing ROI bring Marketing Effectiveness? Does linking Marketing to finance create the robust marketing environment, on which CMOs can jump to be CEO and be business drivers? The answer doesn’t lie so much in semantics and formula equation. It requires the understanding of what does what. 1. ROI has two important components “R”, and “I”, Investments. Both should have proper definition and we know that the reality is otherwise. And even when “R” & “I” can be pinned down precisely, there would still be some decision that will have to be made, such as strategic decisions, macro environment impact. 2. Segmentations is one of the three pillar of marketing. The segmentation decision is extremely important and should be financially driven. However, measures of current use, purchase, revenue, and profit can always predict the Lifetime Value (LTV) of a customer. 3. It is very difficult to predict the consumer behavior change, new trends and extract the financial implication. 4. Product Designs can defy ROI calculations for several reasons. And as such only manufacturing cost can be determined. Even if we best approximate the ROI, one won’t be able to deduce the whys was the ROI bad. An ROI analysis that focuses only on the end result would report a financial failure, but will not shed light on why it happened. The concept of ROI is straight forward. Whether expresses as a percentage of investment or as NPV (Net Present Value) of cash flows overtime, ROI is an important component of the overall process of linking marketing to Finance. But it is not a substitute for a great understanding of how marketing works to achieve business objectives. Financial Results is not what you see on the Balance sheet/Powerpoint presentation but in the field and it is that moment of truth that decides the result. Maybe more CMOs need to go out in the war zone, where the real battle of share is and not just appreciate a good presentation in his swank cabin. Maybe this moment of truth will help them fight the battle harder! As I was driving back home today and cruising through the chain of thoughts, I was reminded of a few regular comments in my organisation, which my marketing folks will not find irregular- Where are the numbers? Marketing can never get their numbers right? Marketing never backs up data. etc etc. The war between between sales and marketing lingers on; numbers and leads and conversion. These are eternal debates and has been a discussion point for many research papers and conferences. However the truth is and the fact remains that at the end of the day and the quarter and the year end, sales is the only factor which has a direct impact on the organisation’s bottomline and it is these numbers that builds CFO’s confidence (and therefore CEOs). Marketing on the other hand, and till this point this would be still contesting and justifying, which gets me thinking- Is marketing an exact science? Let me elaborate a little on what I’m talking about. I happen to attend a session on ROI marketing organised by ZenithOptimedia, where panel included Mr.Santosh Desai (Future Brands), Mr.Sachin Bhatia (MakeMyTrip.com) and a gentleman from new Walmart team. Mr Desai’s thought were very provoking, he said- Numbers are handled very loosely and sometimes we measure for the sake of measuring. Remember, when we made graphs for science lab test. The line in the graph would come first and then would the figures. Results and targets would come first, then the numbers. All of us would have encountered this situation. Now, consider marketing, where the greatest tool/invention is the concept of “Brand”. Ironically, it never features in the balance sheet. But it is a brand which drives the consumer mindspace, preferences to use the product and therefore sales and market. Organisations spend huge time and money to build a strong brand. An ideal stage would be something like Google, where one doesn’t have to spend any money, but before one gets to this situation, one has to do a lot of board meetings and meet quarter end sales pressures. Let me elaborate a little more and dwell on the realm of philosophy. World’s fastest growing company, Google didn’t know what it would become when it launched “Adwords”. Best of the discoveries were not planned. It happened with a mixture of conscious effort and magic (call it hands of god, stoke of luck, belief etc). Robert R Prisig’s book “Lila” (he also wrote “Zen and the art of motorcycle maintainence”) has a very insightful story. P wanted to reach Newfoundland, and prepared well for it. He trained himself as a sailor, gained proficiency in reading stars and maps. And so one day, he started on his journey to Newfoundland. There was a terrible storm and he lost his map, but then his inspiration kept him going. He used his instincts to guide him towards coast. He saw an island and he remembered that newfoundland was 10 kms to the right. Though he could not measure 10 km, he went further and saw some people. In order to ensure that his calculation was right, he asked these people how far was newfoundland. To his surprise he found that he was in Newfoundland! In the process to get the right numbers, right target, right stretch target we seem to suppress our instincts and loose the feel for numbers (read business) and can’t look beyond. If we can’t differentiate between business goals and targets, the numbers become useless to reach goals. We loose the bigger picture. We measure for the sake of measuring and we make numbers to defend our options and resort to precision and more precision. The qualification of success would be how precise we are. And so would be the bonuses! Marketing is philanthropic in its construction and all about hopes, dreams and aspiration and philosophy, which may not follow a polynomial regression equation and extends beyond the number business. Marketing is an inexact science and a creative profession. It is laidback, but performs, we should try to force fit its statistic correlation with bottomline.